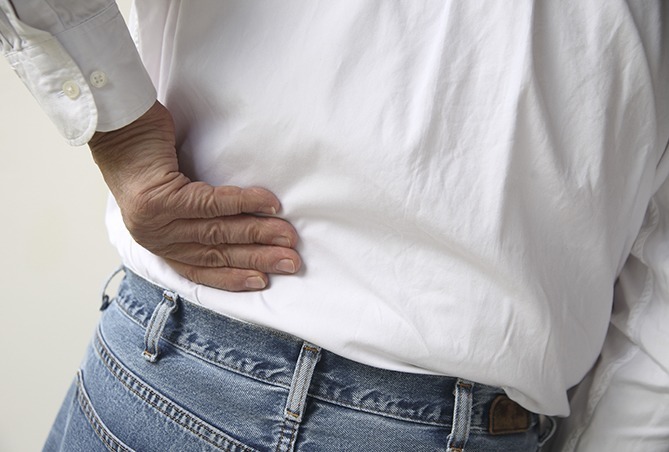 About 80% of people will experience lower back pain in their lifetime, which can last a few weeks or up to several years. Many clients we see with lower back pain are unable to distinguish between hip extension/flexion and spine flexion/extension during movement. They also have poor core activation and spinal stabilization strategies, even after their initial injury has healed. Gently tighten up your deeper abdominal muscles, similar to a large belt that wraps around your waist that extends from your ribs to your pelvis prior to doing these four movements. Remember your pelvis moves in the three different directions, keep it still during all of these awareness exercises. Start by standing with both feet planted on the ground. Now lift your right leg off the ground by bending at the hip until your thigh is parallel to the ground. During this time, you are keeping your pelvis still. Start by standing with both feet planted on the ground. Pre-engage your abdominals. Keep your spine long as you rotate your torso forward, your pelvis tilts around your femur, while reaching your chest away from your hips. When done properly, you will feel a slight stretch in your hamstrings (back of thighs). There should be no movement of the spine. With your torso parallel to the ground, lift your abdomen away from the ground. Imagine being a marionette with strings on the back of your thighs. Keep your spine straight and use your hamstrings and buttocks to lift yourself up to standing position. Place your hands on your thighs, tuck your chin roll down one vertebra at a time. There are 24 moving pieces in the spine. Glide your hands down your thighs as you roll towards the ground. Roll back up to your start position (this is spine extension to neutral). Place your hands on the flat spot on your lower back, sacrum. Now lean back until you feel a pinch or mild pain, this is hyperextension. Come back to your natural standing posture. Open chain is with your foot off a surface such as the ground, while closed chain is when your feet are on the ground/surface. Developing proper movement strategies is key to reducing and preventing lower back pain. These strategies often stay mixed up after the initial injury has healed. A Lifemoves® Kinesiologist will teach you how to retrain the leftover compensatory movements so that you move differently and more effectively which will prevent further injury and reduce pain.